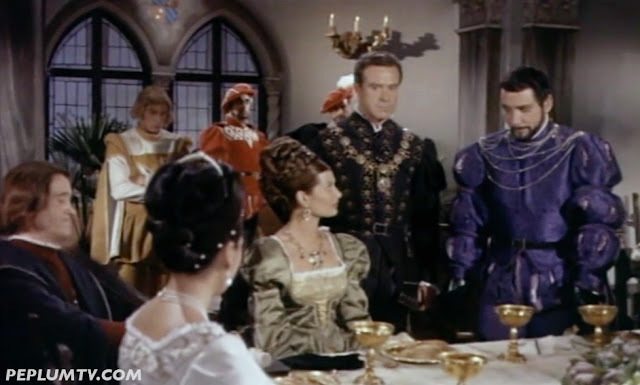 The cast from left to right : Maria Grazia Spina (back to us), Silvio Bagolini, Dina De Santis and Conrado San Martín. I finally got this rare film on DVD, and in English no less, even though my purchase was problematic, to say the least (more on this in a post tomorrow). The cast is a virtual smorgasbord of PEPLUM actors. It's a fun movie, different than the usual stuff. More about Cesare trying to foil his enemies' plans with intelligence and cunning than action. There are action scenes but it's more dialogue than anything else. Regardless, I was pleasantly surprised by this production, and Mitchell gives an excellent performance. The story has a sardonic tone to it which I enjoyed. Thanks for the interesting post. It sounds lime a good film. Is there any chance it might run on Peplum.TV? PEPLUM Cliché : Unrequited love!